The end of the third-party exclusive game? Snake heading to Xbox 360? Konami is officially looking into the possibility of bringing its hugely successful Metal Gear Solid series to Microsoft's Xbox 360. For the non-gamers out there, this is a big deal, as Metal Gear Solid has been a definitive series of games, traditionally associated with Sony's PlayStation. The rumour is back on the agenda, following Konami's Yoshitaka Arai telling Japanese financial news service Morningstar: "The worldwide demand for an Xbox 360 version of MGS4 is quite high, and it is something we are currently looking into." "After the massive success of GTA IV on Xbox 360, and the recent announcement of previously Playstation exclusives Final Fantasy and Tekken 6 coming to the platform, it'd be no surprise for Konami to follow suit," thinks Editor of Official Xbox 360 magazine, Jon Hicks. "The huge install base of the console, particularly in the US, means it's missing out on lots of customers by sticking to the PS3. Of course, Konami has ported MGS for other platforms before – the real news would be if it launched the next game in the series on the Xbox as well as the PS3." "Capcom have already sounded the death knell for third-party exclusives, since the rising costs of next-gen development, and the relatively small user bases of both consoles, mean they make no financial sense," says Editor of PSM3 magazine, Daniel Dawkins. Dawkins is pragmatic, claiming that the best case scenario for any third-party game is a timed exclusive "most likely plumped by format holder 'incentives'), extending anywhere from 3 to 12 months at the extreme, as recently witnessed with Bioshock." "Will MGS4 go to Xbox 360? If pressed, I'd say yes, almost certainly ," says the PlayStation mag Editor, "though Konami may release it as a 'vanilla' port with zero enhancements at the same time as they confirm the extended edition for PS3, a bit like MGS3 Subsistence." The best case scenario (for 360 gamers, at least) would be that Sony release such an extended version on both formats at the same time. "It's of almost zero significance," says Dawkins. "Anyone who's likely to get upset will have finished MGS4 months ago. "The only exclusives from here on in will be first party, and the good news for PS3 owners who find this sort of thing disturbing is that Sony's recent output exceeds Microsoft's in terms of diversity and quality, with Little Big Planet a great recent example." 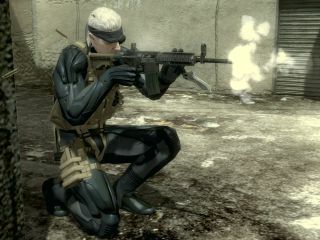 TechRadar has spoken to a Konami rep in the UK, who tells us that the company has no plans right now to release MGS4 on any format other than PlayStation 3.